Morning visit to a Jewish neighborhood, Galata. You will see the Galata tower built by the Genoese in 1303. 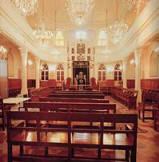 Visit the local synagogues, Neve Shalom and the Askenazy Synagogue. After lunch, visit the Hippodrome, a 3rd century site, where chariots raced during the Roman period. Visit the Blue Mosque, famous for its blue tiles and six minarets. Visit St. Sophia, a world heritage site built in the 6th century. Overnight in Istanbul. Visit the Topkapi Palace, its priceless collection of jewels, and the Grand Covered Bazaar. Overnight in Istanbul. Visit of the Balat neighborhood where you will see the star of David appearing on building facades. 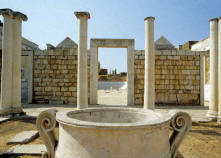 Visit the 15th Ahrida and the Yanbol synagogues. Visit the Jewish home for the elderly along the Golden Horn. Overnight in Istanbul. You may walk to the synagogue to attend morning Shabbat services. The day is at leisure. Overnight in Istanbul. Transfer from Hotel to Istanbul airport. Morning flight to Kayseri and drive to Cappadocia to see the rock-cut churches and monasteries. Drive also to Pasabag and Zelve where you will enjoy the most unusual types of "Fairy Chimneys'' and rock formations. After lunch visit the spectacular Cappadocian valleys and villages such as Uchisar, Goreme and Ortahisar. Overnight in Cappadocia. Drive to the underground city of Kaymakli. Visit this amazing complex with its fascinating tunnels, dwellings and storage rooms. After Kaymakli, drive to old Sinassos (Mustafapasa) which is famous for its unrivaled houses with painted facades. After lunch at Sinassos, drive to Avanos to see the pottery makers. Overnight in Cappadocia. Drive to Konya, ancient Seljuk capital, with its huge monastery complex and shrine of the mystic Mevlana, inspiration of the rite of whirling dervishes. After lunch, Drive to Pamukkale, with its strangely formed natural thermal baths and hot springs. Relax this afternoon in this "natural" spa. Spend a full Day exploring the jewel of Turkey 's ancient past, the ruins of Ephesus. Archaeological excavations begun in 1869 have uncovered well-preserved main streets, squares, temples, theaters and houses. Visit the Great Amphitheater, and stroll down the Marble Way to the magnificent Library of Celcus. Overnight in Izmir. This morning visit the Senora Synagogue (if possible) and Havra Street in Izmir where Jewish immigrants settled in 1492. You'll continue on to Sardes, where you'll visit one of the important historical cities of western Anatolia, the capital of the Lydian State. Sardes has rich architectural works reflecting its magnificent past. You'll see the Temple of Artemis, the mint house where coins were made, the gold purifying center, shops, gymnasium and the synagogue which was once one of the largest in history, built first in the 4th century BC and rebuilt in the 3rd century AC to its present Day size after being destroyed by an earthquake. Overnight in Izmir. Flight to Istanbul. Arrival in Istanbul and transfer to the hotel and overnight.